Metro apps don’t always work as you’d expect. Click the Internet Explorer tab, for instance, and you’ll launch a full-screen version without toolbars, menus or sidebars, which like so much of Windows 8 may leave you initially feeling lost. Right-click an empty part of the page, though, and you’ll find options to create and switch between tabs, as well as a Refresh button, a “Find” tool and the ability to pin an Internet shortcut to the Start page. But if that’s not enough then you can also launch the regular Internet Explorer from the desktop, just as before. Note its icon position on the taskbar – the first being 1, the second 2 and so on – and then you can hold down the Windows key at any time and press that number to open full-strength IE. 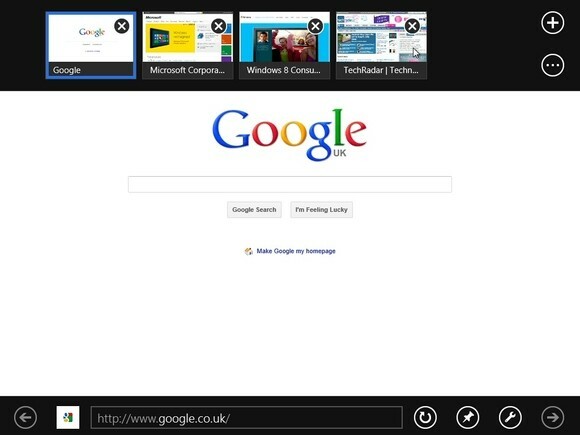 Metro apps are what Microsoft call “immersive” applications, which basically means they run full-screen – but there is a way to view two at once. Swipe from the left and the current app will turn into a thumbnail; drop this and one app displays in a sidebar pane while the other takes the rest of the screen. And you can then swap these by swiping again. 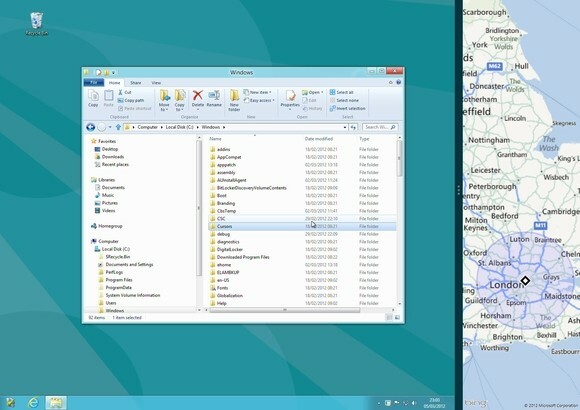 As an example of how you might use this, launch the Map applet and press Win+., then switch back to the Start screen and launch your desktop. And now you have a live, scrolling Map applet on the right side of your screen which is effectively working as a desktop sidebar, and you can access simply by moving the mouse there and clicking on it. If you need more space then drag the separator to the left and the desktop will shrink to a left-hand sidebar, but both apps remain active and working, so you can use Metro and regular desktop tools side by side. Metro apps all have spellcheck where relevant, which looks and works much as it does in Microsoft Office. Make a mistake and a wavy red line will appear below the offending word; tap or right-click this to see suggested alternative words, or add the word to your own dictionary if you prefer. Some programs need you to run them with Administrator rights before they’ll work properly. The old context menu isn’t available for a pinned Start screen app, but right-click one, and if it’s appropriate for this app then you’ll see a Run As Administrator option. The latest Windows 8 apps are better than those in the Developer Preview, but they’re still a fairly random selection and you’re sure to find some that you’ll rarely, if ever use. 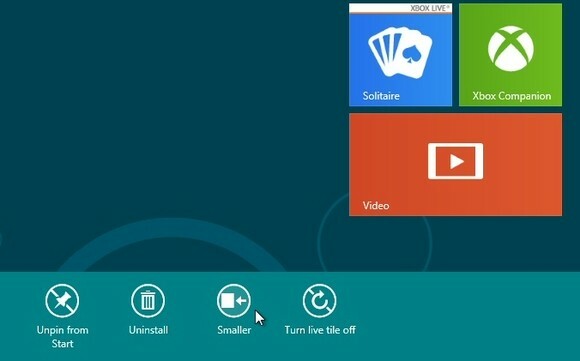 In which case right-clicking one of their Start screen tiles will display a few relevant options. 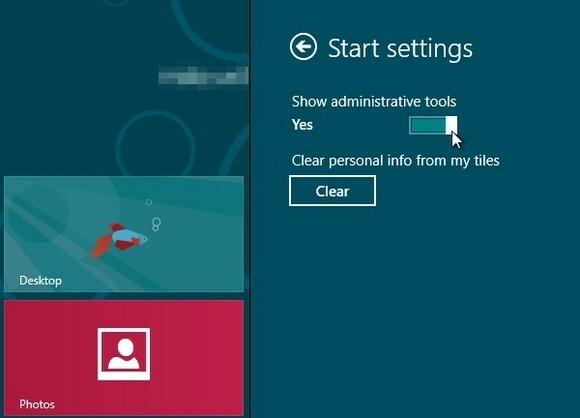 If this is one of the larger tiles, for instance, choosing “Small” will cut it down to half the size, freeing up some valuable Start screen real estate. Or, if you’re sure you’ll never want to use an app again, choose Uninstall to remove it entirely. 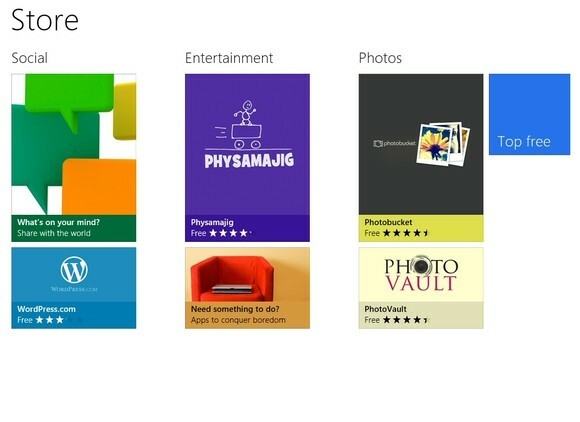 Once you’ve explored your built-in apps then launching the Windows 8 Store will provide easy to access to around 70 more: games, video and music apps, photo tools and more. While not bad for a beta, it’s obviously a very small selection when compared to other app stores, so there’s no need to worry particularly about privacy issues. It is worth keeping in mind that by default Windows 8 apps can use your name, location and account picture, though. But if you’re not happy with that, it’s easily changed. Press Win+I, click More PC Settings, select Privacy and click the relevant buttons to disable any details you’d rather not share. If this proves a problem, though, and you’re willing to take the security risk (because this isn’t something to try unless you’re entirely sure it’s safe), then the system can be configured to run trusted apps from any source. Launch GPEdit.msc, browse to Computer Configuration > Administrative Templates > Windows Components > App Package Deployment, double-click “Allow all trusted apps to install” and select Enabled > OK. Experienced Windows users who spend much of their time in one advanced applet or another are often a little annoyed to see their favourite tools buried by Windows 8. Microsoft have paid at least some attention, though, and there is a way to bring some of them back. Open the Metro Settings panel (press Win+I), click the Settings link, change “Show administrative tools” to Yes and click back on an empty part of the Start screen. And it’s as simple as that. Scroll to the right and you’ll find a host of new tiles for various key applets – Performance Monitor, Event Viewer, Task Scheduler, Resource Monitor and more – ready to be accessed at a click. If you like your PC to boot just as fast as possible then the new Windows 8 lock screen may not appeal. Don’t worry, though, if you’d like to ditch this then it only takes a moment. 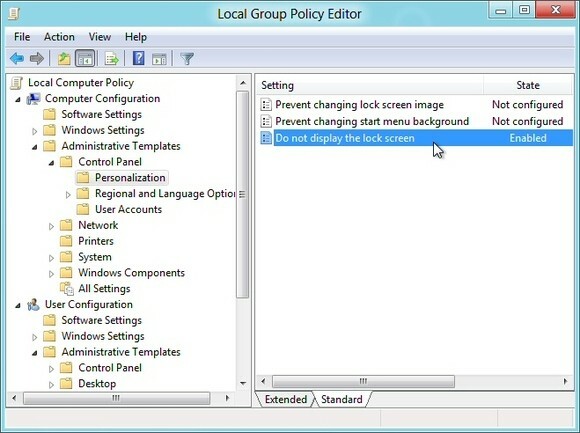 Launch GPEdit.msc (the Local Group Policy Editor) and browse to Computer Configuration > Administrative Templates > Control Panel > Personalisation. Double-click “Do not display the lock screen”, select Enabled and click OK. Restart and the lock screen will have gone. Hold down the Windows key, press R, type netplwiz and press Enter to launch the User Accounts dialog.